M2M Spectrum Networks and Link Labs form a strategic partnership to create an LPWA wireless network for the Internet of Things. 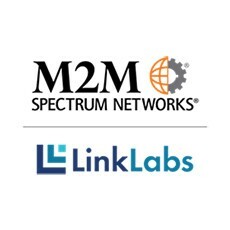 M2M Spectrum Networks (M2M SN), a leading complete solutions provider for Machine-To-Machine communications, today announces that they have selected Link Labs as their technology partner. Link Labs provides a breakthrough carrier grade Internet of Things wireless platform called Symphony Link. Incorporating M2M SN licensed spectrum and Link Labs Symphony Link will create an unmatched LPWA wireless network for the Internet of Things. Symphony Link, which utilizes LoRa wireless technology, is an advanced LPWAN system which features high throughput, wireless firmware upgrades, low powered repeaters, and 100% bi-directional message acknowledgement. Symphony Link is the ideal system for use cases in smart buildings, asset tracking, agriculture, and industrial automation.